ahmadi, younes, neda, naaser. (1393). Localization in Wireless Sensor Networks Based on the Compromise between Range-Based and Range-Free Methods. مجله علمی-پژوهشی رایانش نرم و فناوری اطلاعات, 3(4), -. younes ahmadi; naaser neda. "Localization in Wireless Sensor Networks Based on the Compromise between Range-Based and Range-Free Methods". مجله علمی-پژوهشی رایانش نرم و فناوری اطلاعات, 3, 4, 1393, -. ahmadi, younes, neda, naaser. (1393). 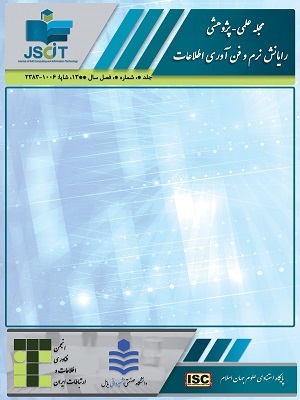 'Localization in Wireless Sensor Networks Based on the Compromise between Range-Based and Range-Free Methods', مجله علمی-پژوهشی رایانش نرم و فناوری اطلاعات, 3(4), pp. -. ahmadi, younes, neda, naaser. Localization in Wireless Sensor Networks Based on the Compromise between Range-Based and Range-Free Methods. مجله علمی-پژوهشی رایانش نرم و فناوری اطلاعات, 1393; 3(4): -. localization demonstrates one of the most important research scope in terms of the wireless sensor networks since much of the information distributed by the sensors are important when including the localization problem. In the present study, two new methods for sensor localization have been proposed, which are indeed a compromise between rangebased and range-free techniques. In the proposed methods, the sensors make use of omnidirectional antenna for transmission of their usual information, and information processing is performed only through some sensors called landmark. The lack of need for complex processing, reduction in the energy consumption, and high precision in locating the geographical coordinates are among the most important features of the suggested protocols. Simulation results show that the proposed methods are highly efficient while reducing system’s complexity.